Arjuna Ranatunga (Sinhala: ; born 1 December 1963) is a Sri Lankan politician, former international cricketer and cricket administrator. He served as the captain of the Sri Lankan cricket team for much of the 1990s, and the team won the 1996 Cricket World Cup under his leadership. He is appointed Minister of Ports (Jan 12, 2015) and MP of the Parliament of Sri Lanka from Kalutara District. A specialist left-handed batsman and part-time medium pace bowler, Ranatungas career with the Sri Lankan national team began in 1982, when Sri Lanka were relative newcomers to international cricket and did not perform well against the well-established teams. He became an important player in the middle order of Sri Lankas batting. Under Ranatungas captaincy, Sri Lanka began to play more aggressively in both ODI and Test cricket the mid-90s. Their growing success rate culminated with a dominating performance and triumph in the 1996 Cricket World Cup. Although some of his actions caused some controversy, Ranatunga was praised for his leadership in raising a team long regarded as underdogs to the status of world champions. 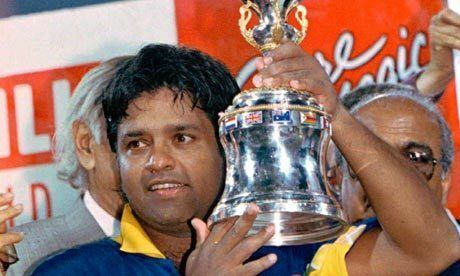 Upon retirement from playing cricket, Ranatunga became influential in the administration of cricket in Sri Lanka and entered politics, joining the Peoples Alliance and winning election to the Sri Lankan parliament. He served a tenure as deputy minister for tourism, and later served as the president of Sri Lanka Cricket until December 2008. He joined the Democratic National Alliance in 2010. Ranatunga comes from Minuwangoda, a town twenty miles north of Colombo. He, along with his brothers, studied at Ananda College Colombo where his mother was a teacher. Arjunas cricketing career started and was carefully nurtured at school. He played cricket for both the junior and senior teams Ananda College. Ranatunga went on to captain Sri Lanka in 1988, taking control of the national team for the next 11 years, transforming it from a weak, routinely defeated team into a competitive and successful unit. He led the team to their greatest cricketing triumph, 1996 World Cup. His innovative captaincy took a Sri Lanka team, given little chance prior to the competition, for crickets greatest prize. His strategies was commended by many cricketing greats and followed by other teams. He was the brain behind the strategy of scoring as many runs as possible in the first 15 overs of an ODI match in which there are field restrictions. This strategy was perfectly executed by Sanath Jayasuriya. This strategy was still followed by the batsmen in the Powerplays. He was widely recognised as a belligerent leader and was famous for defending his players at all costs regardless of what they did. In June 2000, Ranatunga played in Sri Lankas 100th Test match, becoming the only player to represent his country in their first and hundredth Test. Ranatungas weight was also notable for being considered excessive for a professional athlete. It gave rise to an incident during a game played in humid conditions when he called for a runner, claiming that he had "sprained something"; opposition (Australian) wicket-keeper Ian Healy responded with an insulting comment, falling under what is categorized in cricket as a "sledge", which was picked up by the stump microphones and broadcast live on television. Ranatunga was known for controversially calling a runner during long innings due to his level of fitness. After the second final of the One Day triangular series in Australia in the 1995/6 season, when the incident with Healy occurred, Ranatunga instructed his players not to shake the Australian players hands. During this match, Sanath Jayasuriya and Australian paceman Glenn McGrath were also involved in physical jostling; Jayasuriya accused McGrath of racially abusing him, a claim that the bowler denied. He entered into politics by joining the PA led by Chandrika Kumaratunga. Later, he was the Deputy Minister of Tourism for Sri Lanka. In 2010, Ranatunga left PA and joined DNA endorsing Presidential Candidate Sarath Fonseka. After a rift with party leader Fonseka, on September 2012, he resigned from the party.